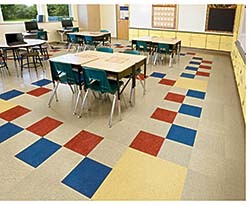 LinoArt Linoleum Granette Tile is available in 24-by-24-inch, 12-by-24-inch, and 12-by-12-inch tiles. Comes in a variety of colors, textures, and embossing options. Coating resists scratches, scuffs, soiling, stains, alcohol-based hand sanitizers, and high-pH cleaning chemicals, according to the company. Made up of organic and mineral-based raw materials, and contains up to 35 percent recycled content.